Two rare original drawings of Tintin from the comic album “The Red Sea Sharks” go under the hammer Saturday, in a seldom-seen sale expected to rake in huge sums. A pencil-on-paper 35.2×50 cm (13.8 x 19.6 inch) design and a 30.7×47.7 cm India ink copy, drawn by the Belgian cartoonist known as Herge in 1957, could fetch between $720,000 to $960,000 (618,000 to 825,000 euros), auctioneers said. The two drawings depict page 58 of the intrepid boy reporter’s adventures in the 19th album by Herge, known as “Coke en Stock” in French and published in 1958. They show 12 panels starting with Tintin, his crusty sea-going friend Captain Haddock, his faithful canine companion Snowy and the eyepatch-wearing Estonian pilot Piotr Skut looking out to sea. The action seamlessly moves underneath their ship, the S.S Ramona, where an attempt by a frogman to plant a limpet mine is cut short as he is hit on the head by a dropping anchor. The mine is then eaten by a ravenous shark which swims off emitting a series of hiccups, while the diver is treated on a nearby submarine, his head heavily bandaged. In the last panel, Tintin and Captain Haddock look on in disbelief as the limpet mine explodes far off to sea after a final hiccup from the shark. The pages “are excellent examples of Herge’s clear-line drawing technique,” said Brussels-based comic art expert Eric Verhoest. “But it’s not just the drawings, it’s also the way he moves the story forward. 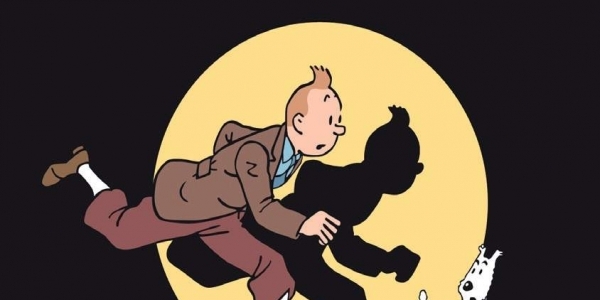 Herge was a master in doing this,” Verhoest told AFP. “With great ingenuity, Herge arranges the spaces according to the locations” — on board the ship, under water and in the submarine, added Heritage Auctions, which is putting the drawings up for sale in Dallas, Texas on Saturday. The auction house will also livestream the event at its Dutch headquarters outside Utrecht. Original Herge drawings rarely appear on the open market as the artist did not have to sell his original artworks, but occasionally gave them away to close friends as gifts, Heritage Auctions added in a statement. Herge gave the set on auction Saturday to a “Scandinavian friend” in the 1970s who later sold it to a buyer “in a German-speaking part of Europe,” Verhoest said. Earlier this month a rare original 1939 illustration from the comic book album “King Ottokar’s Sceptre” sold for more than 600,000 euros at an auction at Christie’s in Paris. The record for an original page of Herge’s drawings dating from 1937 was set in 2014 when it sold at over two million euros.